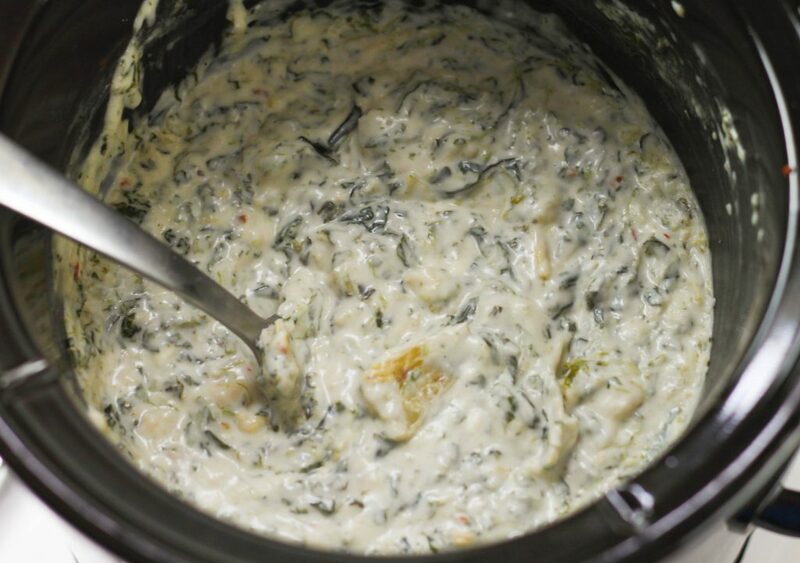 Are you looking for an easy Crock Pot Spinach and Artichoke Dip? Look no further! 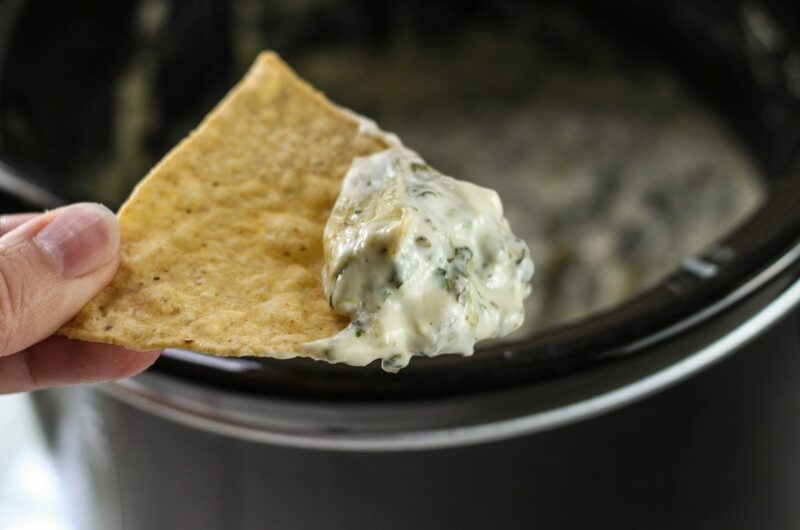 This recipe is cheesy, delicious and perfect for tailgating or parties. The first time I made this was for a girls weekend. It was a big hit and since then it’s a staple at football parties, New Years Eve and when we have friends over. It’s an easy appetizer than can be quickly tossed together in a slow cooker. This is a dump and go recipe. Toss all of the ingredients in a 1 – 1/2 quart (or larger) crock pot and heat through, stirring occasionally. You can alter the heat in this recipe by adjusting the amount of crushed red pepper, more or less depending on your taste. I prefer to use a brand name Alfredo sauce or even a garlic Alfredo. I think the flavor is a lot better but you can use the brand you typically buy. I usually serve it with tortilla chips but veggie sticks are also good with. 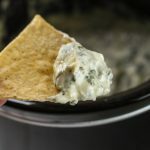 I have been wanting to try smothering chicken breasts with this dip and baking it. I think it would be super yummy, so be on the lookout for the recipe in the future! Mix all ingredients together in a 1 1/2 quart crock pot(or larger). Cook for 2-3 hours on low or until heated through, stirring occasionally. Keep on warm or low until serving. Do you add the blocks of frozen spinach or should you thaw them first? Also, if this is for a big party can it be doubled? Thank you. Good question! I updated the recipe. You can thaw them by putting them in a strainer and then running hot water over them until thawed. Just make sure to remove any excess water before adding to the slow cooker.